White sand, couple of palm trees, and cabanas. Life is good at Arashi Beach, Aruba. Swimming Conditions: Excellent with calm water. North of Malmok Beach and approximately 500 meters south of the California Lighthouse you will find Arashi Beach. 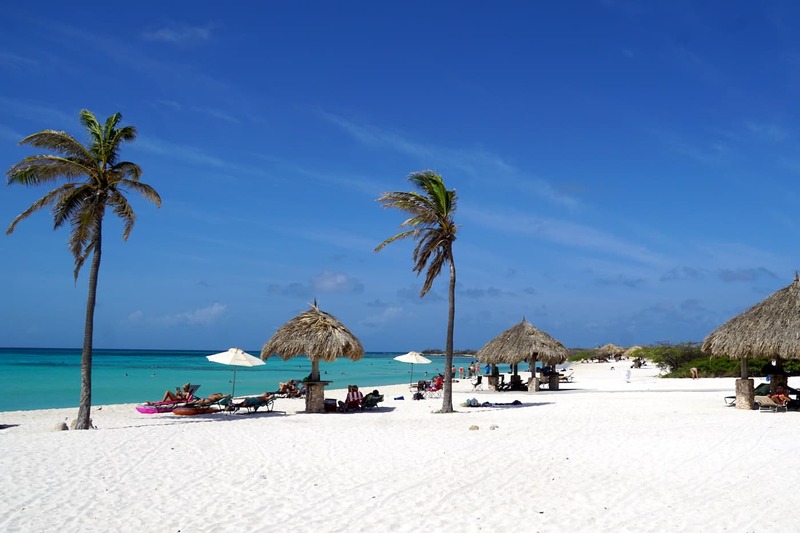 It’s the northernmost beach located on the northwest coast of the island and it is frequently visited by both tourists and the local people of Aruba. This beautiful, quiet beach is about 700 meters long and faces west, overlooking the blue waters of Arashi Bay. It’s a great beach for snorkeling and making pictures during sunset hours. Featuring calm and shallow waters with rich Caribbean underwater life, Arashi Beach offers fantastic snorkeling and swimming opportunities. The waters at Arashi stay shallow for quite a distance, but always be careful as the waves can sweep you further out if you are not careful and swim out too far. There are no watersports restrictions at this beach, surfing here is allowed. The wind is mostly offshore, waves are gentle and there’s a nearby reef that’s popular with surfers. Generally speaking, kitesurfing at Arashi Beach is for advanced riders only. Arashi Beach is very suitable for families with children, at the beach you’ll find some huts with roofs made of dried palm tree leafs that provide some shade when needed. Arashi tends to get a little rocky on the north side however, so it may be a good idea to bring some beach shoes. As there are no other facilities besides a spacious parking area, you’ll want to bring some refreshments and food too. South of Arashi Beach on L.G. 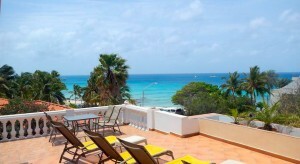 Smith Blvd and in between the Arashi and Boca Catalina Arubus Stop, you will find Beach Apartments Aruba, a 6 apartments property offering family rooms, a tennis court, free parking and free WiFi. The rooms at Beach Apartments Aruba all have air conditioning and smoking is not allowed. Each apartment has a kitchen equipped with an oven, a microwave, and a toaster. Cable TV is present too. What really sets these apartments apart is the terrace that is included with the property. Especially sunsets will give you unforgettable moments to memorize. The view is just breathtaking! The beach is within walking distance where you can enjoy swimming, snorkeling, windsurfing, paddleboarding or just spend time and work on your tan. When you feel like playing golf, the Tierra del Sol Resort is just a 5-minute drive away. To the north, there’s the California Lighthouse, one of Aruba’s main points of interest definitely worth visiting. 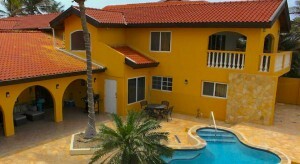 Beach Apartments Aruba will offer you quietness, privacy and lots of relaxation. It’s a family-friendly accommodation. Pets are allowed. Just south of Arashi Beach, you’ll find the Arashi Beach Villa that’s become available for rent recently in 2016. From this beach villa, you’ll have quick access to both Arashi and Boca Catalina. It’s a large townhouse that recently has been renovated to comply with modern living standards. It features five bedrooms and bathrooms, all with high wooden ceilings. The beach villa can comfortably accommodate up to 10 persons. The villa features a salt water outdoor pool with pool deck, a beautiful patio, and covered porch, and balconies on the upper floor with lovely views over the Tierra del Sol Golf course and the outdoor pool. This villa is perfect for those who’d like to prepare their own lunch and dinner, as it comes with a fully equipped kitchen and a breakfast bar. Children are allowed to stay, so this beach villa is very suitable for families as well. To reach Arashi Beach from Oranjestad, make sure you follow directions north to L.G. Smith Blvd and keep on following the road until you’ve reached the sign for the beach. Turn left and then just follow directions to the parking area. It’s about a 12-kilometer trip and it should take you about 15 minutes to get there, depending on traffic.